I recently attended a concert by Natalie Merchant, an alternative rock singer from my college years, who, with her stunning voice. has experimented with different music platforms over the years. This time, she performed with the Seattle Symphony so her songs had a different sound and beat than her recordings and other performances do. Perhaps to go along with that more stripped down style, Merchant was dressed simply and elegantly, swirling around in a black form-fitting dress with a lovely wide skirt, accompanied with heeled Mary Janes. She seemed comfortable and confident in her mid-life body and I was also impressed by her long, now fully gray, smooth, loose hair. It was as much a part of her act as her exceptional voice. She looked real, she looked like an adult, she was beautiful. Celebrities know more than most that outward appearances matter, as it is these that we use to present ourselves to others and manage impressions. Some of us are more calculating about our appearances, striving to make a statement, or to express ourselves (this is how I interpreted Merchant's style), but for most of us, (those of us with the means to choose what to wear), we are just trying to not stand out too much. To do this, we first have to know what is normative. In the Pacific NW, for example, dressing for the symphony or dressing for church, well, these are fairly indistinguishable from dressing for the every day, and all involve a fair amount of earth tones, denims and khakis, flat shoes. There are no real uniforms for different events, and comfort is the operative word. The symphony crowd at the Merchant concert was dressed in this typical (in my mind uninspiring and somewhat sloppy) manner. Despite my opinion, this is simply the dressing norm where I now live, the Seattle aesthetic so to speak. In contrast, the French style has been described as real, adult, respectful (see two descriptions: http://www.vogue.com/1648381/lauren-santo-domingo-parisian-style-french-women-make-coffee/ and http://www.parisescapes.com/paris_wear.html ) All this means is that the French have stronger expectations for what is appropriate dress for different settings and they do not consider sweats and running shoes as regular streetwear (see my earlier discussion of this: Les tenues, April 2013). The French are no more real or adult than Americans, but their social conception of how an adult dresses is simply different. In the U.S. we might call the French style 'dressing up'. I hear that often when I have a skirt on in the driving rain, or have worn something other than sneakers to an athletic event. I don't think of these as dressing up but as normal, or authentic for me. I prefer styles that imply effort, thought, care, creativity, purpose (is this 'conscious dressing'?). I also like the new attention placed on the dressing choices of older adults. Before, it seemed that creative dressing was reserved for the young. 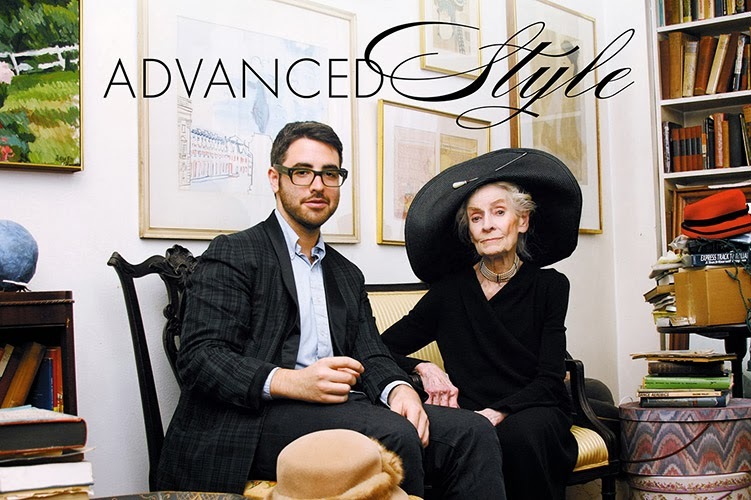 But, creativity and effort and style are ageless: here's a street-style blog I recently discovered that explores the style choices of older people: http://advancedstyle.blogspot.com/ (see below). Dressing up? Dressing one's age? How about a style where one dresses authentically for the real, adult person that one is? Ps. There is no reason that such authenticity must be maintained when it comes to naturally graying hair. That's the adult prerogative! The Sociological Observer by Anne Katriina Tuominen is licensed under a Creative Commons Attribution-NonCommercial-ShareAlike 4.0 International License. Based on a work at www.thesociologicalobserver.com. Moikka Anne, kiva postaus! Minä muistan edelleen miten kivoja juttuja sulla aina oli, ja tyylikkäitä vaatteita :). Ehkä minäkin tässä vielä opin joku päivä, ranskalaiset on vaan aina niin chic..